Return flight from Perth (Jandakot Airport) to Rottnest Island in your own private plane with pilot. Departs Jandakot at various times through the day of your choosing and then departs Rottnest Island also of your choosing, on that same day or another day. This booking is for a four-seat Cessna 172 aircraft (pilot occupies one seat). The standard price for this aircraft is $490. With TWO PASSENGERS that makes $245 EACH. With THREE PASSENGERS that makes $164 EACH. 3. Free Parking at Jandakot Airport. This aircraft seats from 1 to 3 passengers. Two kids less than 30kg each can share a seat - contact us. Infants can travel with an adult - contact us. There is a strict legal limit of 300 kg total combined weight of passengers and luggage. 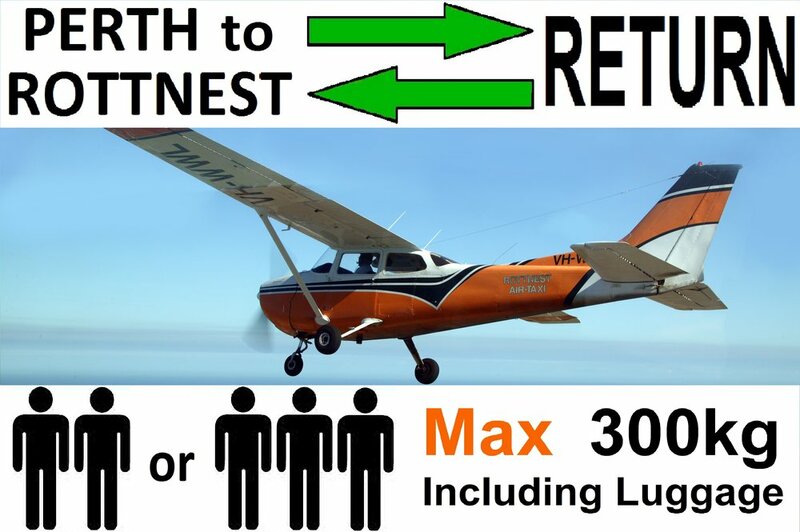 If you are over this weight, you will need to book our 6-seater aircraft. There is only limited space for luggage - so no large suitcases please, nor are we able to carry surfboards, bikes or most strollers! Maximum luggage 45kg. Please, no dive tanks, camping stoves or other dangerous goods.